Most, if not all, food in Guédé Chantier, Senegal is cooked over a wood fire. This is typical of the situation in much of rural sub-Saharan Africa. The acquiring of firewood often is a task that is added to all of the other household and farming/marketing tasks that are carried out by women. In addition to the labor component, when the fire is built in a confined area, the women often develop breathing problems due to the inhalation of soot from the cooking fires. The gathering of wood by a village of any size also has an impact of the tree population of the area as limbs are constantly cut from living trees to provide firewood. Through the European Union, Guédé was given a grant that was divided among the districts in the community. One district decided to invest their grant in the development of women owned and operated businesses. A second district decided to use their money to fill in a depression that filled with water every time it floods. A third district chose to invest its money in a forestry project to increase the number and quality of trees in and around Guédé. Two of the districts chose to pool their money and use it to improve the schools and build additional classrooms for the students. One district decided to invest in biogas digesters that would turn human, animal and crop waster into biogas that could be piped into the kitchens of their homes and used just like natural gas to cook their foods. The money provided by the European Union was not great enough to provide these biogas digesters to each household in the district, but their presence would serve as a demonstration project and a test of the feasibility of building biogas digesters for each household. The participating households each had to contribute 10 percent of the cost of the construction and installation of the biogas digester on their property. Initially the digesters were going to cost CFA 40,000 (approx. US$ 83.33). The cost to the household would be CFA 4,000 or US$ 8.33. After community input and a redesign by a young engineer from Dakar, Project Manager Serigne Madjou—his friends thought he was crazy to take on a project so far out in the rural area—read the literature and redesigned the configuration of the biogas material collection and biogas digester so that it could accommodate household vegetal waste, and animal waste as well as human waste. With the reconfiguration of the system, Serigne was able to improve its versatility and at the same time reducing the cost to CFA 30,000, reducing the co-payment by the owner as well. Serigne also modified the layout of each system to meet the configuration of each household. While the sand cement, rebar, and the digester were purchased, the concrete block was made in Guédé and all of the labor was provided by local workers who were quite proud of the quality of the work they were doing. The system consists of a Turkish toilet that is used by all members of the household with an additional access hole where additional organic material—cooking waste, animal dung, plant material—could be put into the system as well as holding tanks and a digester. From the digester, the natural gas would be piped to the kitchen area of the house. 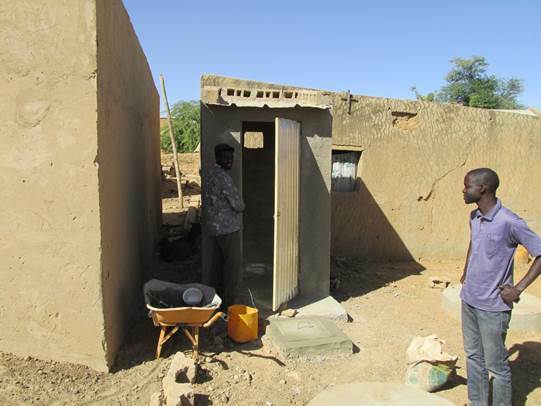 Project Manager Serigne Madjou (r) inspects the work on the biodigester project for one household in Guédé Chantier. One of the workers (l) is making sure that the door to the Turkish toilet fits and locks. On the ground can be seed the concrete components of the biodigester system. When the system is completed it will provide biogas that can be sued to cook the food for a household, eliminating the need for burning wood. As the community works on its forestation project, the use of human, animal, and vegetal waste for biogas will reduce the cutting of wood in the community and the development of a nice forest along the banks of the Doué River. And as a bonus, the biosdigesters will provide humus that can be added to individual vegetable garden plots or farm fields. One of the challenges of a demonstration project like this is to make it replicable with minimal or no outside help. It is clear that the skills for constructing the digester have already been developed within the community. The challenge will be to find the money to bring in the porcelain Turkish Toilet, sand, cement, piping, rebar, biodigesters, and stoves need to make sure that they are installed in every home in Guédé. That will be a challenge with which the community as a whole will have to wrestle. But as we have seen they are ready to take on challenges that will improve the life of Guédé. If, as we work in Guédé, we can figure out how to construct biodigesters within the resource base of the community, then the project becomes replicable in other communities as well. Even in the absence of outside funding, other communities will become able to take on the installation of biodigesters in their communities to protect the health and workload of women, reduce the cutting of scarce firewood allowing for the reforestation of communities, and protecting them from encroaching desertification as rainfall continues to decline.